WEBCommentary(tm) - Global Warmists Gone Bonkers? An article by Dr. Benny Peiser of The Global Warming Policy Foundation highlights the absurdity of today's advocates of the discredited theory that human emissions of carbon dioxide are significantly warming global climate. Speaking to friends and writing about the "human-caused global warming" (a.k.a., "Anthropogenic Global Warming", AGW) scam, I often observe that as evidence of the silliness of such claims, imagine the following scenario. Suppose climate scientists determined with absolute certainty that the next Ice Age had begun with predictions of much colder weather throughout the coming years. 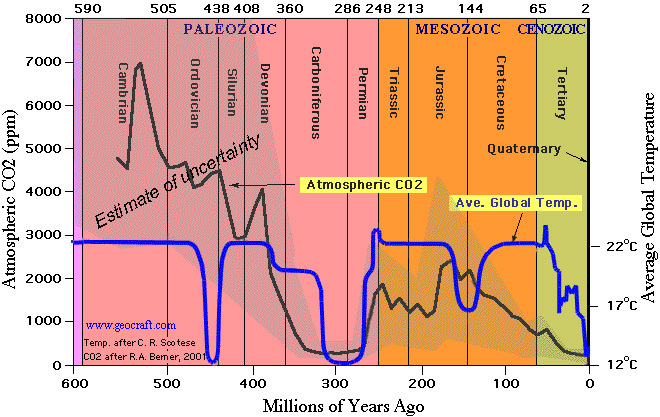 Note that about 438 million years ago one of the deepest Ice Eras/Ice Epochs/Ice Ages earth has ever experienced occurred at a time when atmospheric carbon dioxide was 4500 ppm, more than ten times today's amount! One need no other evidence to observe the folly of the AGW theory. Today, Dr. Benny Peiser (GWPF) has an excellent piece (Global Warming To Save The Planet?) that reveals there are actually those who are now making the very absurd suggestion I had been using as an illustration for years!